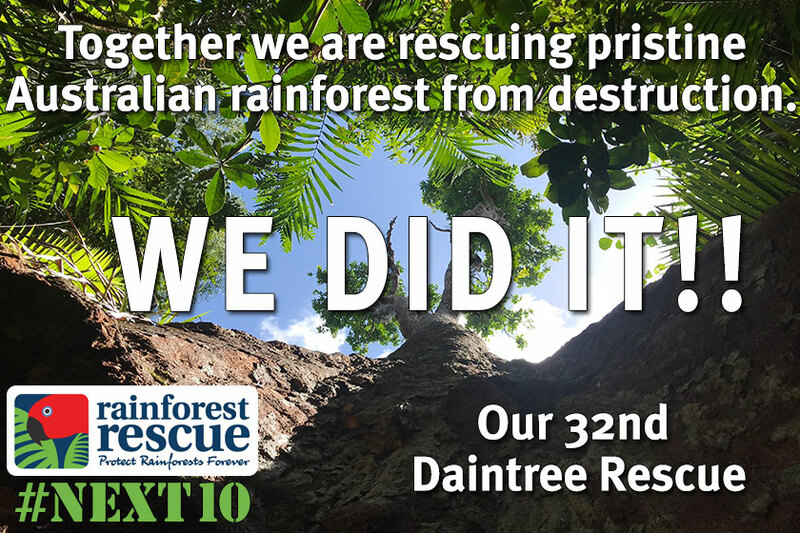 Rainforest Rescue - News - 3 Down! Daintree Property #32 Going Back to Nature! #NEXT10 - 2 Down 8 to go was successful! Thanks to Rainforest Rescuers who contributed to our holiday campaign, our 32nd Rainforest Property is set to be rescued thanks to Rainforest Supporters! That's our 33rd in Australia! This property represents a remarkable opportunity for all of us. Bordering Aboriginal Reserve Land - which in turn backs onto the National Park - on one side and Forest Creek on the other. This land is rich and ripe for rescue. In addition to its location and its rich state, its relationship to the creek helps to maintain the quality of water that flows through and into the Daintree River, and then onto the Great Barrier Reef. #Rainforest2Reef!! The owner had approached us, knowing that this rainforest block is special, asking us if we could help protect it, forever. At almost 3 hectares this will be a substantial contribution to the greater Daintree. It is essential that this property is brought back into the Daintree. 239 Donors came together to make this opportunity a success. Many donors contributing add up to great big totals - and because of the many donors contributing from a few dollars to many thousands, this property is going back to Nature. Rettet den Regenwald - Rainforest Rescue Germany - is a non-profit that advocates for rainforest protection around the world and has partnered with Rainforest Rescue here in Australia to help us in our mission to Protect Rainforests Forever. They contributed significantly to our appeal to purchase this rainforest land, and they supported our efforts to purchase and protect Lot 19, Cape Tribulation Road in last year's campaign. They are making a big impact in protecting rainforests in Australia and beyond. Our partnership is powerful, and appropriate. We're grateful to have such a wonderful partner and such an effective partnership. Thanks to every one of you who make this important work possible and who helps Protect Rainforests Forever!